Most of us audiophiles usually embark on car stereo system overhaul as the first upgrade after getting a new ride. You’ll need the best sounding car speakers because these speakers are the center point of your entertainment most times you’ll be on the road. We often get asked many questions most of which will be answered in this guide. 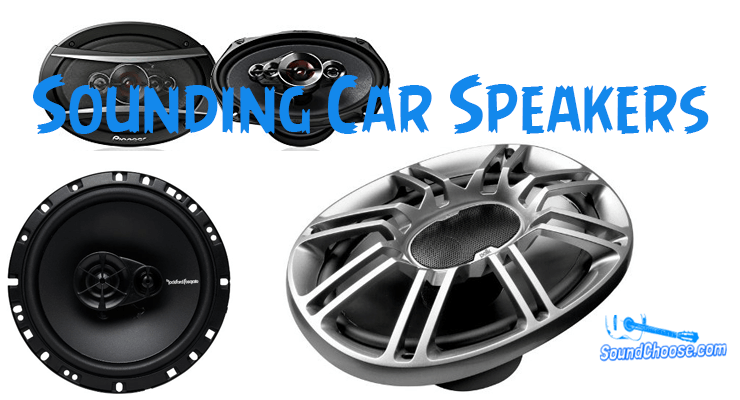 These questions include getting the guides to the best door speakers for bass and sound quality, the best door speakers for cars, the top-rated 6.5 car speakers, best 6.5 speakers for car doors as well as the best car speakers without a subwoofer. It is important to ensure your car gets the right fit of the best speakers from the best car speaker brands to ensure maximum high-fidelity sound output. This is going to be a really comprehensive and explanatory guide which we’ll conclude with our top five recommendations of the best car speakers to help with your decision-making. But first things first, let’s answer some questions. Shall we? How do I choose the best sounding car speakers? It all comes down to the basics as these are what will endear most audiophiles to a speaker in the first place. What are these basics to consider? Let’s check this out! There are usually two power indices that get touted around by manufacturers most often. These are the peak power and the RMS power of which both are measured in watts. While the peak power stands for what it is, the RMS is what should really concern you as it is the amount of power output your speaker will be able to handle on a continuous basis. It is advisable for people with separate amplifiers to purchase the best car speakers with nearly the same power the amplifier can churn out. Talking of build quality, you would do good to avoid most cheap-looking speakers. This is true because most of those are made from cheap materials that will easily wear out in the face of regular use after a while. Aside from a compromised useful life, low-quality speakers with cheap components are known for their mediocre sound output which most times are considered flat and boring which in turn may strain your precious ears. If you’d be operating within a very tight budget, we’ll give you suggestions later on in our recommendations of some of the best 6.5 speakers and more that would deliver excellent sound quality as well as a prolonged useful life while still being reasonably affordable. Tips:Speakers with rubber surrounds are durable and have a great sound quality. You may as well go for a foam and textile surround as these are still better than foam and paper. Although speakers aren’t designed for bass, speakers with lightweight woofer components such as a mixture of polypropylene (PP) and mica or metal-coated fabric would still provide some bass and are durable. While most people will often take a higher sensitivity rating to mean a better speaker, this is not always the case. In fact, a speaker with lower sensitivity is preferable if you have a high-powered stereo system. Only properly powered speakers will give you the highs and mids that will turn around how you enjoy your music. Other than with high-powered systems, you should go with speakers with high sensitivity rating. Although it is not an indicator of how good it is, the sensitivity rating tells how efficient the speaker handles the power applied to it. Aside from knowing which type of speaker you would need, there still some personal considerations and decisions you will have to make. Let’s briefly discuss this below. After you confirm and make up your mind as to which speaker you want, it is important you know the configuration, size, and measurements of the existing setup so that the new one will be a perfect fit. You may simply pull out the old ones and measure them or you may need your car make and model at the point of purchase to ensure you do not put square speakers in round holes. Get that? There are speakers of various sizes. The JL Audio C5-653 speakers are priced around $700. Although these are some of the best car speakers for bass and sound quality, they are pretty pricey but they are also highly functional. The JBL GTO Series – JBL GTO638 6.5-inch 3-way speakers are priced below a $100. They are much more affordable and still, they are also some of the best sounding car speakers we know. There are even more affordable models as you’ll see in our review and recommendation in the concluding part of this guide. It is not a coincidence that some companies and certain manufacturers are known for producing the best sounding car speakers, the best 6.5 speakers for cars and trucks, as well as some of the best car speakers for bass without subwoofer as we said earlier (car speakers are not meant to churn out bass but some of the best car speakers from the best car speakers brand do). For most people, their best car speakers brand would be one of JBL Car Speakers, Infinity Car Speakers, Kicker Car Speakers, Sony Car Speakers, Pioneer Car Speakers, Kenwood Car Speakers, Alpine Car Speakers, Rockford Car Speakers, JVC Car Speakers, Polk Audio Car Speakers and a few others. Although these car speaker manufacturers produce excellent brands and models of speakers, we took our time to review some of these speakers and came out with our five top picks and recommendations for the best sounding car speakers. We’ll bring you a first-hand review of these speakers as the concluding part of our buying guide, we hope you find one of these for your needs as they are the best 6.5 speakers as well as some of the best door speakers with which you can upgrade your car’s stereo system. On the most frequent occasions, the factory-fitted speakers in your cars would often be sub-par and mediocre at best. Rather than use audiophile grade components, most factory speakers are cheap and are mostly useful for conversation. When it gets to vocals and music, these would definitely not bring out the best. For this reason, you’ll definitely need some of the best door speakers to turn up the entertainment a notch higher in your automobile.Once installed, you’ll realize the beauty and fun that can come out of a carefully installed high-fidelity car stereo system. From the multitude of speakers we had to review to build up this guide, here are the top five recommendations of the best sounding car speakers. Although it was not an easy task, reviewing excellent speakers from different brands, after careful examinations of the excellence and drawbacks of all brands and models we found out the JBL GTO638 as the leader of the pack. Let’s check out all of these amazing speakers. These JBL GTO Speakers emerged as the overall best in our review of the best car speakers for sound quality that are not easily found in the other brands. The 3-way speakers are incredibly affordable, just shy of $100 and are really valuable considering the richness and clarity of their output. The speaker features the patented ‘Plus One Woofer’ cones which are designed and engineered to deliver clear and crisp bass. The 4-ohms design of the speaker also efficiently pulls out as much as possible power from the car’s stereo system. When you need the best car speakers for bass without subwoofer, then this JBL GTO638 Speakers may be what you’ve missed all along. Here comes another of the best 6.5 speakers for your car’s entertainment hub. We sure did our homework and if you are an audiophile, chances abound that you’ll easily recognize many of these speakers coming top of our list as the best in their categories. The Kicker DS65 6.5″ Coax Speakers are great and reputed for their excellent mids and highs. Although the bass is quite good, you may turn up louder with a pair of Kicker subwoofers for more bass. The titanium tweeter and the extended voice coils in this highly durable pair of speakers produces one of the cleanest and crispiest bass we found in the best car speakers we reviewed. Some of the features and specifications in this speaker include but not limited to the following. As far as we tried, the only major issue has been with the harness that comes with the package, you may have to get some more screws to keep them tightly in place. Looking for some of the best budget car door speakers for the value, then this should be your answer. The Rockford retails for less than $50 and as affordable as it is, the build quality and sound performance coupled with the value also made it a strong contender in the race among the best sounding car speakers in the market right now. The 6.5 speaker is highly loved and accepted not just for the low price but still because it delivers decent upgrade to car stereo systems. If you are in the market for some of the best affordable 6.5-inch door speakers with good bass and sound quality, you’ll definitely not be disappointed by this speaker. Let’s see some of the features we’ve got in the speaker though. It was a tough call trying to find the better between this Pioneer A-Series and the JBL GTO638 as both seem to have been engaged in a locked-horn battle. When the sound output was tested across the frequency range, the highs and the mids were awesome and accurate at best and only the lows seem not as great. The sound output from this beast is so loud and accurate a lot of our listeners prefer it to most other models. If you are looking for something with a high volume potential, then this is your thing. While it is not top of our list, hardly will you find a review without the Pioneer A series in them and in most times, they are top of the log. You know you are getting the best when your car speakers are coming from reputable manufacturers like Polk Audio or perhaps JBL, Pioneer, and the others. While the Polk Audio DB691 is not just carrying the Polk brand name for the sake of it, the brand stands for excellent audio and this has been proven over the years. The Polk Audio DB691 is a 3-way speaker that looks really good and keeps churning out great audio with its impressive sound quality. When you need some bass without subwoofers, this beast gets the job done. Its silk dome tweeter is also engineered and designed to churn out very impressive highs and lows and at no point will your ears be fed with harsh sounds that may strain them. Nothing comes close to feeling the excitement and atmosphere when some of the best sounding car speakers deliver accurate and precise sound output just as the artists intended. When you need to get in the midst of this excitement, the best car speakers in our review will ensure you do not miss out on the fun. In place of mediocre and tacky paper woofer factory speakers, you can turn the heat on with a pair or more of the best 6.5 car speakers and you’d thank us you did. For the purpose of clarity, you should really get one of these as they’ll all offer you high-fidelity awesome sound entertainment. We’ve done so much to help you with tips and tricks around getting the best car speakers for bass and sound quality. For a more direct approach, we presented you five of our top picks for the best car speakers of 2018. The ball is in your court to make your final decision to take your automobile entertainment to the next level of high-fidelity enjoyment. Rather than stick with those mediocre speakers that come with your car, any of the best door speakers above will turn your entertainment world around.